Southern right whales were so-called because they were the ‘right’ ones to hunt. Their tendency to move slowly and live near the surface also makes them perfect for whale-watching, either boat-based or from the shore. Every year thousands swim up from Antarctica to enjoy the spa-like conditions of the southern Cape. 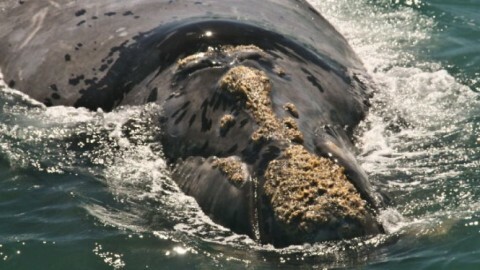 You can easily identify a southern right whale because its twin blowholes make a v-shaped blow. 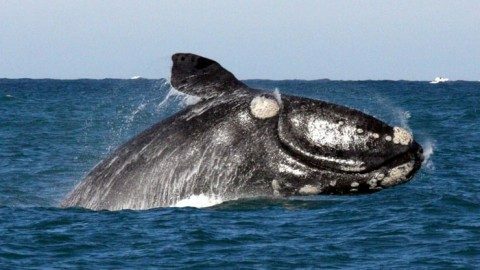 Every June and July, the first southern right whales arrive between Cape Town and Port Elizabeth. Their migration from Antarctica to the warmer waters builds to a slow crescendo over the next few months. August and September are the peak – most pregnant southern right whale mothers are here by then. The mothers are touchingly tender with their calves, often inviting them onto their bellies for a cuddle and a rub with their great squarish flippers. In other parts of the ocean, mating games are proceeding, with up to seven males courting one female. Others amuse themselves by sailing head-down with their tails in the air, or leaping into the air again and again. Even from the shore it’s clear they are having a good time. Their massive bulk, slow speeds and liking for shallow waters means they are easily seen – a real boon for whale-watching. Things have improved dramatically for southern rights whales in the past 70 or so years. When whaling was officially stopped in 1935 around the world, there may have been only 300 or so southern right whales left. Most South African coastal residents don’t remember seeing whales at all during the 1960s, 1970s or even 1980s. But by 1998, their numbers had increased so much – along with human fascination – that the South African government had to draft legislation to limit and govern boats approaching whales. Without a permit, boats may not approach closer than 300 metres, and cows with calves may not be approached at all. There are a limited number of permit holders that offer boat-based whale-watching, and they are allowed to approach to within 50 metres of whales. 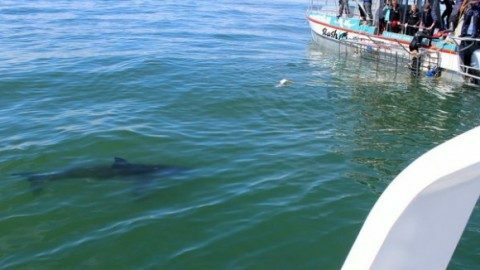 Sometimes whales will move away, but other times they swim towards boats – apparently out of curiosity. South Africa now has some of the strictest whale legislation in the world, and the whales have responded to this protection, increasing their numbers every year. Southern right whales are not the largest in the ocean (that honour belongs to the majestic blue whale). But they do offer up some astounding statistics. Adults are roughly the size of a bus and weigh up to 60 tons. In fact, they are undoubtedly some of the roundest whales, sometimes giving the impression of enormous hippos in the water. Whale milk is some of the richest in the world. Calves are born weighing around 1.5 tons and gain 85kg a day. By December the whales are almost all gone, back on their long journey to the icy Antarctica, and fattening up again on krill and tiny plankton.